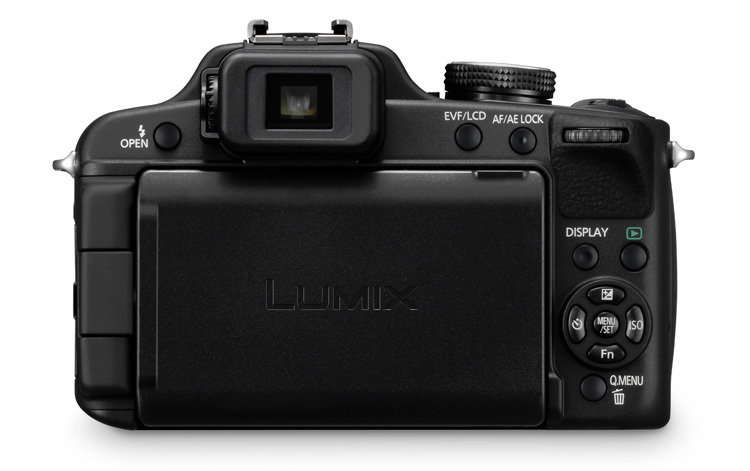 Despite stellar specs, Panasonic’s Lumix DMC-FZ100 takes noisy still photos and poor-quality video. The FZ100 is one beefy Mega-Zoom. The basic-black camera weighs 1.2 pounds with battery so it has a very substantial feel. It has a nice textured surface and like all Mega-Zooms, looks just like a small DSLR – and at $499 it’s priced like an entry-level DSLR but without interchangeable lenses and larger APS-C sized sensors. What it does have is a 24x optical zoom with an excellent focal range of 25-600mm. You’d have to spend a fortune for similar coverage with a DSLR, a key reason these cameras are so popular. We love the 25mm option and the impact it has on landscapes, architectural shots and even portraits – and that 600mm telephoto option catches faraway birds sitting in the trees. It’s not the 840mm of the Canon PowerShot SX30 IS but it’s pretty potent. The front of the 4.9 x 3.2 x 3.7 (WHD) FZ100 is dominated by the optically stabilized lens. You’ll also find an AF Assist/self-timer lamp, remote sensor in the hand grip and too many white, red and gold decals. Calm down boys; look at the SX30 IS for inspiration which hardly has any “marks” and looks very cool. The top has a hot shoe for optional flashes and mics; large Dolby Digital Stereo Creator built-in mics are on the auto pop-up flash. Next to this is a large mode dial, a shutter button surrounded by a zoom lever, a dedicated red dot video button, a key to switch quickly into burst mode and the on/off switch. The burst options on this camera are pretty amazing—you can grab up to 11 frames per second at full 14.1MP resolution, far beyond most DSLRs. The mode dial options are similar to a DSLR, offering everything from iA Intelligent Auto to PASM (Program Auto, Aperture- and Shutter-Priority, Manual). Aperture options are f/2.8-8.0 with shutter speeds of 60-1/2000th of a second. There are also specific scene modes on the dial (portrait, landscape, sports, macro, night portrait). Move to Scene and there are 17 more, Custom lets you set three favorite settings, while Movie lets you choose between four exposure modes. Clearly this digicam offers more options than the basic aim-and-forget iA and it’s as close to a DSLR as you can get without tearing off the lens. The rear has two key features—a .2-inch EVF with diopter control rated 202K pixels and a vari-angle 3-inch LCD monitor that lets you hold the camera at a variety of angles. The screen is high-quality 460K pixels. The Canon SX 30 IS has a 2.7-inch vari-angle screen rated 230K. The Panasonic’s Auto LCD setting adjusts brightness to the ambient light and we had no issues even in direct sunlight. A small speaker is on the right side of the EVF. 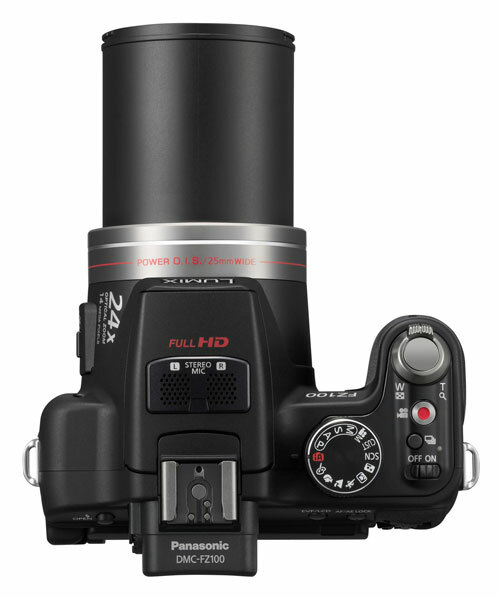 You’ll also find flash-open, EVF/LCD and AF/AE Lock buttons along with a conveniently positioned jog wheel. With this you scroll through your aperture/shutter speed options, pressing in on it to switch between the two. It adjusts other settings like exposure compensation, depending on the mode. To the right of the LCD is a four-way controller with center Menu/Set button. The four-points of the compass give access to ISO (100-1600), Function for adjusting film mode, self-timer and exposure compensation. Surrounding the controller are Display, Playback and Q. (Quick) Menu buttons. On the left side are two compartments. One is for optional mics/remotes while the other has USB and mini HDMI connections. The bottom of the Made In Japan camera has a compartment for the Lithium-ion battery which is rated a very good 410 shots and the SDHC/SDXC card slot. Definitely use at least Class 6 speed for recording HD videos. We used a 32GB Class 10 SanDisk Extreme SDHC card for our tests.